where fvwd is the design shear strength of a weld given in 4.5.3.3(4). Aw is the design throat area and should be taken as the area of the hole. 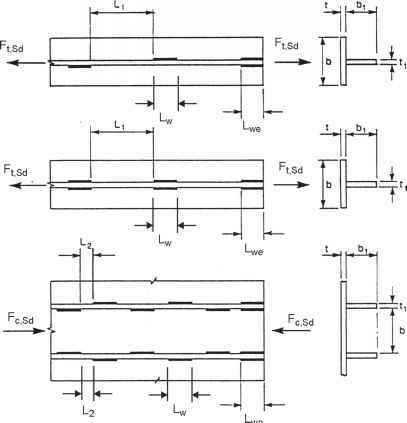 (1) The distribution of forces in a welded connection may be calculated on the assumption of either elastic or plastic behaviour in conformity with 2.4 and 2.5. (2) It is acceptable to assume a simplified load distribution within the welds. (3) Residual stresses and stresses not subjected to transfer of load need not be included when checking the resistance of a weld. This applies specifically to the normal stress parallel to the axis of a weld. (4) Welded joints should be designed to have adequate deformation capacity. However, ductility of the welds should not be relied upon. (5) In joints where plastic hinges may form, the welds should be designed to provide at least the same design resistance as the weakest of the connected parts. (6) In other joints where deformation capacity for joint rotation is required due to the possibility of excessive straining, the welds require sufficient strength not to rupture before general yielding in the adjacent parent material. (7) If the design resistance of an intermittent weld is determined by using the total length Ztot, the weld shear force per unit length Fw>Ed should be multiplied by the factor (<e+l)!l, see Figure 4.7.